Borgward will showcase an electric version of its BX7 SUV, pictured, at the Shanghai auto show later this month. BEIJING -- Borgward Group, the German automaker revived by a state-owned Chinese truck maker after going bust in 1961, has surprised many including its own CEO by racking up more than 30,000 units in sales for its first model over eight months. The winning formula: touting its German heritage while saying as little as possible about its Chinese backers. At the Shanghai auto show, later this month, Borgward will showcase the electric version of its BX7 SUV that's slated to be available later this year alongside the BX5 compact SUV that went on sale last month. At a starting price of 149,800 yuan ($21,700), the BX5 will compete with similarly priced compact SUVs from Chinese carmakers SAIC Motor Corp., Changan Automobile Group Co. and Guangzhou Automobile Group Co. The smaller BX5 will complement the BX7 SUV that made its debut last year. Borgward traces its roots to 1924, when Carl F.W. Borgward, an engineer, designed and built a motorized carrier cycle called Blitzkarren. By the 1950s it was the third-largest carmaker in Germany and accounted for 60 percent of the country's auto exports. As part of its marketing, the company shipped vintage Isabella coupes to China while inviting Chinese customers on tours to its birthplace in Germany. No mention is made of the role of Beiqi Foton Motor Co., the state-owned truck maker that paid 5 million euros ($5.3 million) to buy the Borgward nameplate from the founder's grandson in 2014. "You do not smell the money behind the product," Borgward CEO Ulrich Walker, 65, said in an interview in Beijing. Chinese consumers are getting more attuned to quality and safety in their automobiles, he said, and "want to show their success with a foreign brand, and if that's a German brand representing German engineering, even better." There's good reason why the new Borgward isn't mentioning its Chinese parentage. Domestic brands are still perceived to trail overseas peers in quality, according to annual surveys compiled by industry researcher J.D. Power. More than half of the cars sold in China bear foreign nameplates and one in five are German marques. At a recent media event in Beijing in March, the company paraded 13 vintage Borgwards with a collective age approaching 1,000 years. Walker recounted to the gathered press and guests the Borgward story, starting from the workshop in Bremen a century ago. "The brand's been dead for 50 years, what bloodline are you talking about?" said Tian Yongqiu, an independent auto industry analyst who monitors Chinese carmaker acquisitions. "Besides the nameplate, everything is Foton. It may be a German brand but Chinese manufacturing know-how. Quite a lot of consumers don't know, and believe their story." Borgward's early success -- the BX7 outsold the Jeep Renegade and Chevrolet Captiva -- underscores the affinity that Chinese consumers have for German brands and the difficulty faced by automakers in convincing consumers to pay a premium for local brands. Great Wall Motor Co. and Zhejiang Geely Holding Group Co. are among Chinese carmakers trying to remake a reputation for cheap, utilitarian cars by introducing new premium brands, setting up overseas engineering centers and hiring foreign engineers and executives. Borgward developed the BX7's engine on its own and uses auto components from Germany's Robert Bosch and Japan's Aisin Seiki Co., while working with China's Huawei Technologies for cloud technologies and South Korea's LG Electronics for batteries. Major suppliers for the BX7 also include Delphi Automotive, Magna International, Autoliv, Continental and Faurecia, which signed pact to form a joint venture with Borgward in November. The company plans to expand its network of dealers to 200 by the end of this year. With a factory in Bremen scheduled to start production next year and capable of making 50,000 vehicles annually, Borgward plans to sell electric SUVs in Europe, starting with German-speaking countries. It also plans to export its two China-made SUVs to emerging markets in India, South America and Middle East from this year, Walker said. 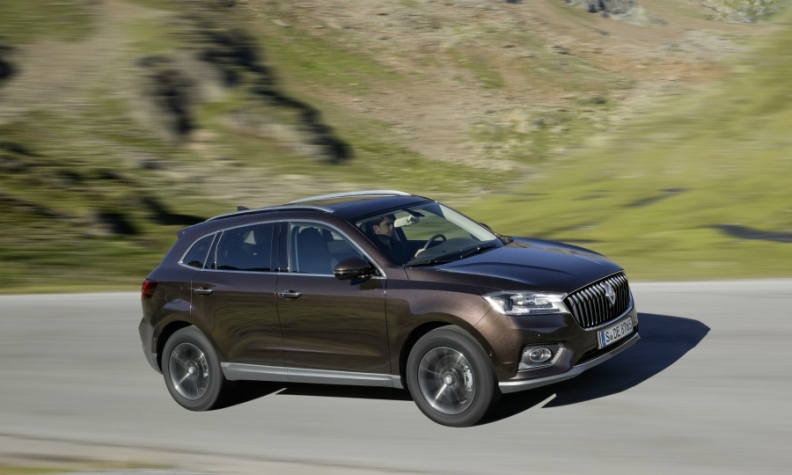 Borgward will be a new experience for the young, well-educated buyers that it's targeting, who would not have been born when the brand last existed. "In Germany, only some elderly people of more than 60 years have heard something of the ancient brand; in other European countries, nobody knows the name," said Ferdinand Dudenhoeffer, director of the Center for Automotive Research at the University of Duisburg-Essen in Germany. "Is that really a winner story for Chinese customers? I don't believe in that."